JacRox is a cloud accountancy specialist firm based in Manchester. It combines its expertise with Xero's cutting edge technology, providing a service their clients depend upon 24/7. 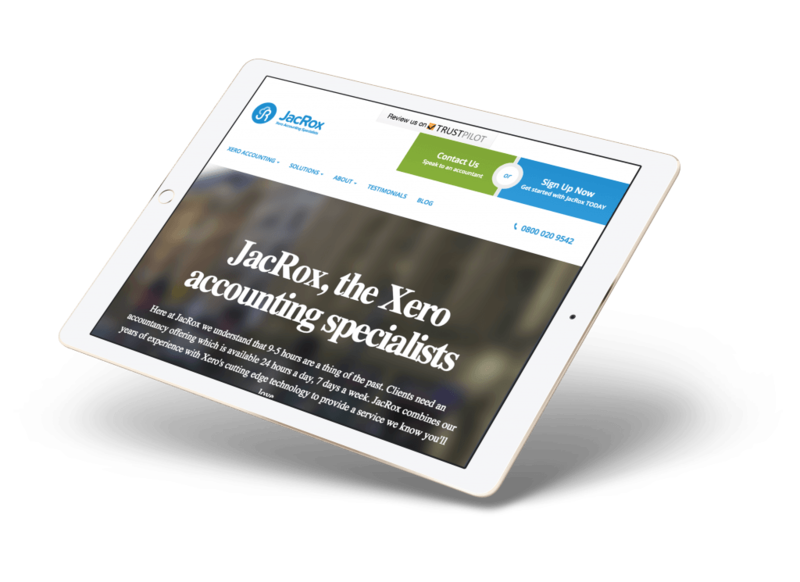 Accountancy firm Jack Ross wanted to create the sub-brand JacRox for their specialist online accountancy service, using Xero as a platform. They needed a brand identity creating, a fresh website, a marketing strategy to grow a new client base, and expected to prosper to greater Xero partner status. Working with JacRox, we researched the marketplace for cloud accounting, discovering keyword search phrases and competitors. We formed a web and marketing strategy to achieve the ambitious targets. Following this, a highly user-centric responsive website was produced by Soap. This was based upon a clean brand design which would be easy to use, whilst simultaneously catering for the needs of potential clients through various packages. Working to a tight deadline, the end result was highly positive and JacRox were extremely satisfied with the result. We created various branding and creative concepts which worked with the Xero brand and were a stand alone from their current firm Jack Ross. From this we designed a brand identity that was memorable and recognisable. We created a financial website design which is user-friendly, meaning it is highly engaging for clients. By designing the website in WordPress, JacRox are able to easily update and quickly make changes to the website themselves . This new website now promotes them as an accountancy specialising in Xero, and features their Gold, Silver, and Bronze packages designed to suit the needs of their clients. Responsive websites are vital for businesses in the internet era, and we rapidly adapted JacRox’s site for mobiles. Embracing the same distinctive colour schemes as the desktop site, mobile users meet with a bold and informative layout which delivers big on information and ease of use. Soap Media worked closely with myself and our team to understand our customers and deliver a refreshed image which reflected our ethos and high standard of service. The new CMS is intuitive and will help us easily update site content in the future, and the refreshed colour scheme really stands out. We’re also delighted to be fully modernised, with mobile-friendly features helping find us even more customers. I can't recommend Markerle, Adam, and the Soap Media team enough.